There are many different traditions that come under the heading of ‘Magic’. Some of these are Wicca, Gardnarian, Dianic and many more. Even within these traditions there are different branches. Each have their way of working and set of beliefs and practices. You may or may not include a religious element within the practice. In a lot of ways the fundamental point is that that individual practices their beliefs as they choose. For most forms there is a general set of beliefs and practices (from this you will be drawn to one particular tradition or another) but within this there is room for interpretation for the individual. Many people who practice magic are solitary i.e. they work alone and may never meet up with others of like mind whilst others will meet up with other solitaries from time to time. Coming together in this way is not a coven; simply a group of individuals working together. A coven is a formal group of individuals who choose to work as a group in a more structured and permanent way. Wicca is probably the first type of magic that people encounter as it is easily accessible and through the tv and other media it has a higher public awareness. Such things as Harry Potter, Charmed and Buffy has created an interest in all things magical particularly with younger people. It has to be said that there is a huge difference between the tv and film idea of magic and the actual practice! But having said that these programmes and films have opened people’s minds to the concept of magic and that there is more to the world than we currently know. Magic is about working with energy. It is one of many ways to work with energy and is strongly linked with the earth. Whichever way you work with energy you are essentially using the power of your mind to achieve your ends. The difference is down to the practices, rituals or other method you use to work. Present day ‘witches’ often follow what can be described as Green or Hedge witchcraft. This is probably the closest to what could be called the original witchcraft. Green or Hedge witches would have been the wise woman living in the woods who prepared the potions and lotions for the ills of their villages. Many witches who were burned or hung for witchcraft were convicted because of their herbal craft. Whether or not you follow the religious aspects within the magical traditions there is focus on balance. The source, Creator, or God is viewed as the God and Goddess. Neither is more than the other both are equal but different. Balance is a theme throughout all things day and night, light and dark, male and female and so on. There is emphasis on respect for the self and for others. There is also a large part of the practice that includes divination such as palmistry, crystal ball, tarot, scrying bowl or mirrors, runes and tea leaf reading to name but a few. 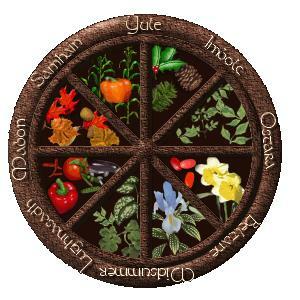 The Wheel of the Year features in most earth based practices in some form. This represents the changing seasons and each season is marked by a ritual relevant to that time of year. In times past we were all living in tune with the seasons and really this is still important to us now. Knowing the growing seasons and the cycle of grow still applies to our food in exactly the same way. With the constraints that are beginning to show in food production, the need to consider our Carbon Footprint and so on we can all help ourselves by growing our own food and getting in touch with the process again. The Year begins after Samhain (Halloween) so this is the Pagan New Year. Throughout the year there are Sabbats celebrated linked to the positions of the sun and earth, and thirteen moon related Esbats are celebrated. The dates given will vary slightly year to year and some people will celebrate the stated dates other the actual time according to the exact time the moon changes direction. Over the year there is the progress of the life of the God and Goddess and this parallels the growing season of plants. Samhain represents death and the promise of rebirth, the last harvest of the year. It is the point at which the God passes over through the Tomb of the Dark Goddess and is to be made ready for rebirth later in the year. This is the time of year that it is said that the Veil is at its thinnest or when it is easiest to connect with Spirit. Celebrations at this time of year usually include remembering those who have passed over during the last year and before and also a time to release inappropriate behaviours and habits. You can do this by writing down whatever you wish to let go of and then burning the paper in your ritual fire. The Goddess is recovering from the birth and this is a time of purification and preparation for the planting in Spring. Ostara marks the Spring Equinox and the time of preparation and planting of seeds. The influence of the God and Goddess is to encourage growth. Beltane is a time of pollination and the breeding of animals. The God and Goddess celebrate their union and in like fashion this is the traditional time for Pagan weddings known as Handfasting or Jumping the Broom. Midsummer or Summer Solstice is the height of the Earth’s fertility and the time that the God impregnates the Goddess. The time of the first harvest. The God now sacrifices himself to give his life essence to the earth into the very grain that we eat. He then passes into the Underworld or Shadowland. Second harvest is at this time and the land is beginning to die down for the end of the year. The God is now ruling in the Underworld and there he is waiting for the Goddess to join in as the Crone. This is the cycle of life throughout the year. These are the names of the moons throughout the year. There are alternative names for these moons but these are probably the most common names. There is also the Blood Moon, when the moon appears blood red). Any of the moons can also be a Blood Moon and the occurrence would be read as an omen dependent upon the time at which it appears. The Blue Moon is the second full moon in one month (this happens infrequently as hence the saying ‘once in a blue moon’).